The sponge I used is a very simple sponge which was taken from one Periplus book. Actually it is a victorian sponge recipe. This cake doesn't use any other fat except eggs. The texture is soft but on a slightly dry side. You can add about a tablespoon of oil or melted butter to make it a bit moist. I used my 8 inch tube pan (chiffon pan) for this. 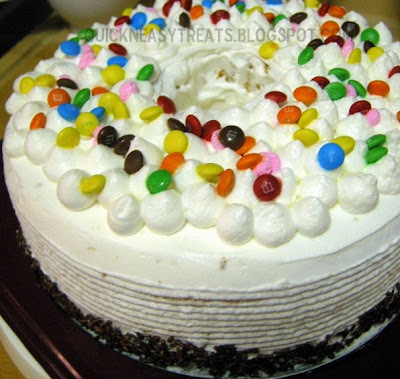 For my decoration, I used non-dairy whipped cream and mini m&ms .. Sprinkle the m&ms after your chilled the cake as the colour will bleed.